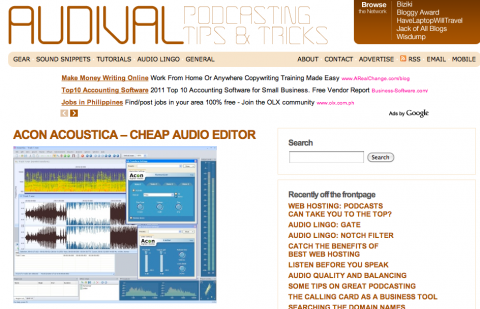 Audival: The Best Blog on Podcasting out there! We believe that our recently launched blog: Audival – is the best blog on podcasting on the web! Run by Stefan Hedengren, a professional musician better known as Stiff, the blog offers a mass of daily information to help people get into the world of podcasting with the use of tips, articles about equipment as well as sound clips for use in podcasts. Here is just one sample post to whet your appetite! I thought it was time for a new USB microphone post. The previous one doesn’t really capture the market anymore, and some newer readers might never had found it anyway. So here’s a selection of what’s out there today. Keep in mind that I haven’t tried and compared these. Samson is one of the few companies out there that actually has a full lineup of USB microphones, including C01U, C03U, G-Track (which has a built in audio interface for instruments! ), and the Q1U dynamic. Blue Microphones Snowball. The Blue Snowball looks cool (top picture), but I don’t hear great things about it, which is a little odd since ‘normal’ microphones from Blue usually gets praised. A comparing review of Blue Snowball and Samson C01U can be found at Macworld. 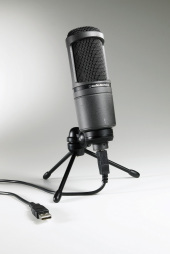 Blue Microphones latest USB solution – the Snowflake – is a beauty. It’s not a good thing that I can’t seem to find much info about it on their website, but my previous post can perhaps help a little with details, and my constant mention of it shows how cool I think it looks. Like Samson, MXL has a whole series of USB microphones. Besides the now standard types of condenser microphones, they have stereo USB condenser microphones. Check out my previous post on the 990 stereo condenser. Røde Podcaster is the famous company’s podcasting solution, and from what I hear, it’s pretty good! You’ll also find a close to meaningless video of it on the above link. Alesis USB-Mic Podcasting Kit is one of the bundles out there. Besides the microphone, I believe it includes a stand, headphones as well as the audio application Audacity (which is free anyway). M-Audio Session Music Producer is as the name suggests intended for (low budget) recording musicians, but the package might be of interest to podcasters as well. It includes a USB microphone as well as recording software. Audio-Technica AT2020 USB is based on the companies original AT2020 (non-USB) model. I recently stumbled upon the Phoenix Audio Solo, and I thought it at least looked nice. Phoenix calls it a “desktop conference microphone”. Nady has two USB microphones on the market: the dynamic USB-24M and the condenser USB-1C. sE Electronics, famous for acoustic solutions for microphones among other things, also have two USB microphones on the market, the USB2200a, and the USB1000a. The actual sound snippets are all made by Stiff, for Audival, unless otherwise mentioned, and are free for use in your own productions. The only thing you can’t do is sell them, or repackage them and sell them. It’s also a great looking site, with a dazzling design by Stiff‘s brother, Thord. So head over to Audival now and get into the world of podcasting!